Megatrends are shaping the future core competencies of corporate headquarters. Closing the gap between ambition and realistic goals is critical – particularly in the area of digital transformation. What megatrends are affecting corporate headquarters in these times of growing volatility, uncertainty, complexity and ambiguity? 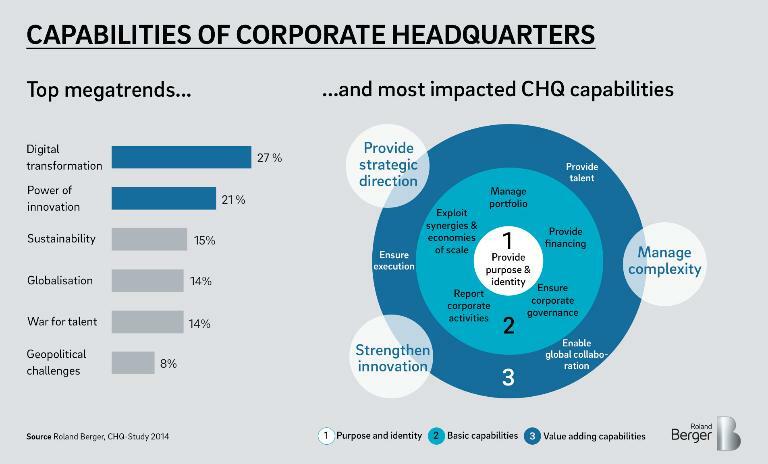 How do those megatrends affect the skills and capabilities required by corporate headquarters? And how does reality match up to expectations? The Roland Berger 2018 Corporate Headquarters study sought to answer these questions. More than 300 executives from the head offices of companies across various industries in 11 different countries participated in the study. 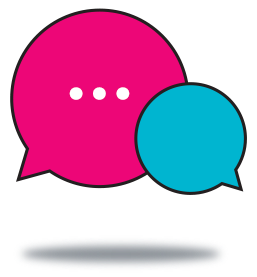 23% of top managers report dissatisfaction with their corporate headquarters. 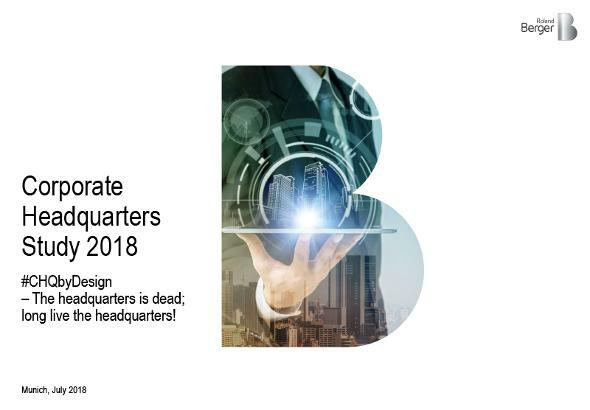 Respondents reported that the two megatrends that have the biggest impact on corporate headquarters are digital transformation and innovation. They considered geopolitical challenges to be less important, contrary to expectations in these days of Brexit uncertainty and trade disputes between Europe and the United States. Digital transformation and innovation were seen as more significant even than the war for talent – a real surprise given the number of column inches dedicated to the skills shortage, especially in Germany. How well-prepared are corporate headquarters for these megatrends? To answer that question, we developed our Comprehensive Capability Framework, where a total of twelve different capabilities are matched against the megatrends. The result? The megatrends have the greatest impact on value-adding capabilities, namely strengthening innovation, managing complexity and providing strategic direction. How well-equipped are corporate headquarters to master the tasks ahead? The study identifies a gap between ambition and reality primarily in the area of digital transformation. Automation (robotics, artificial intelligence), company-wide networking (collaboration platforms, social networks, apps), and digital data (Big Data, the Internet of Things) are particular areas where corporate headquarters will face new types of challenges in the future. "We found that digital transformation and power of innovation, rather than geopolitical challenges, have the biggest impact on Corporate Headquarters." The task of developing key future capabilities for corporate headquarters varies in its scope depending on the function and area. Strategy and IT functions will be particularly affected in the future when it comes to closing the gap between ambition and reality. What about the size and organizational structure of the central office? Here, again, the study presents a varied picture. The trend toward shared service centers and organizational decentralization will grow, while the trend toward geographical decentralization will continue as at present. Some 77 percent of respondents said that they were happy with the current performance of their central office. But responses differed when we asked participants how the functions of corporate headquarters would be provided in a few years' time, and by whom. Just over half (56 percent) said that they believed the central office would have to give up certain functions in the future, while just under half (44 percent) disagreed. This lack of agreement suggests that the role of corporate headquarters is not so much eroding as in permanent state of change. Top executives must prepare for this transformation if they want the central office to retain its significance and functions.